New ice hockey players can appear awkward and ungainly on the ice. To skate well you need great balance, and to balance well on skates you need to be able to control your edges. Good edge control will increase your overall control, balance and produce a much smoother stride. Performing edge drills will help beginners right through to pro players improve and become more accustomed to their skates. If you are a complete novice, consider starting with balance drills. However, you can still try the edge work drills, as the only way to improve is to challenge yourself regularly. If you are a more experienced ice hockey player, work drills also provide a challenge. Firstly, ensure you perform them correctly. Then increase the power. Next add speed, and finally, add a puck. This progression technique allows you to perform the same work drills, in the same routine, while continuing to improve as a hockey player. Like field hockey drills, ice hockey concentrates on stick control, tackling and shooting – http://news.bbc.co.uk/sport1/hi/other_sports/hockey/4186758.stm. It differs in the playing arena and travelling action. Skating adds another level of technique and practising edgework drills will improve your control and overall game. Watching drill videos helps hockey players improve their techniques and become better players. This is true for both field hockey and ice hockey and is relevant the world over, for example Sportplan offer support to Australian field hockey teams with their drill videos. These useful aids have helped International teams become more successful. You have two edges, the inside and the outside edge. Accelerating – Use your inside edges. Lean forward with your feet and skates at an angle across the ice. With each stride, dig in your blades to produce power. Gliding – Both edges are in contact with the ice but you are not using them. Glide on the hollow in between the edges. Turning – Use one inside edge and one outside edge. Your sharp blades will grip into the ice allowing you to make quick sharp turns. 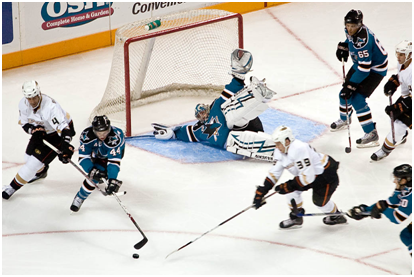 Stopping – Use one outside and one inside edge, bend your knees, get low and angle your skates. Don’t carry your weight forward as your edges will dig in and you need to slide a little bit on the blades to stop.